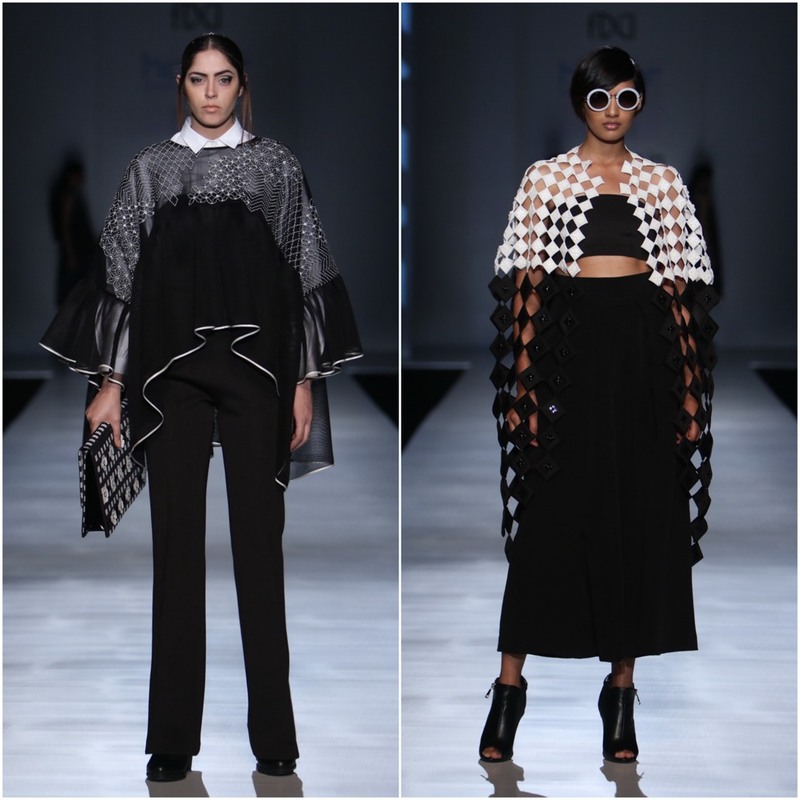 The duo Pankaj & Nidhi presented their Autumn Winter’17 collection powered by Honor entitled “Telefunk” on Day 2 of Amazon India Fashion Week in association with Maybelline New York. 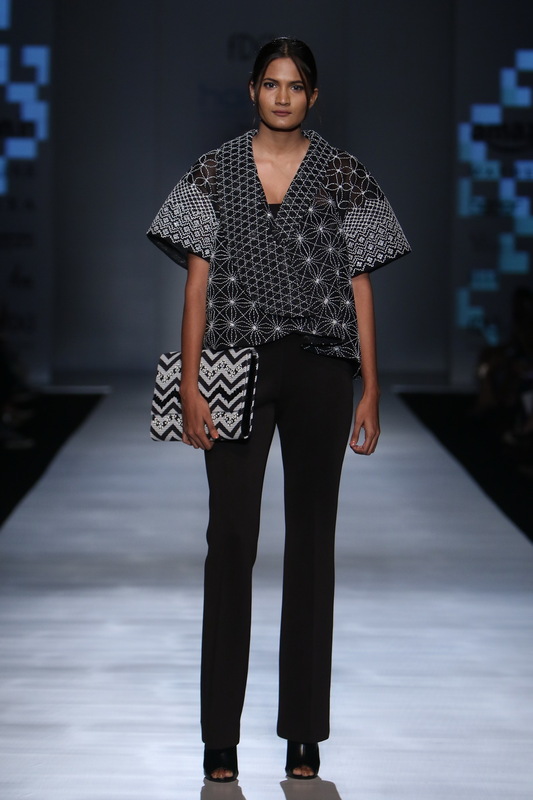 Telefunk is a collection in a sharp monochromatic palette of black & white ensembles. The start saw peplums with motifs and tops with bell sleeves. Classics are updated by introducing geometricity in the cut to create square cape tops & volume jackets. Long & short sleeves could also be seen with lots of layering. 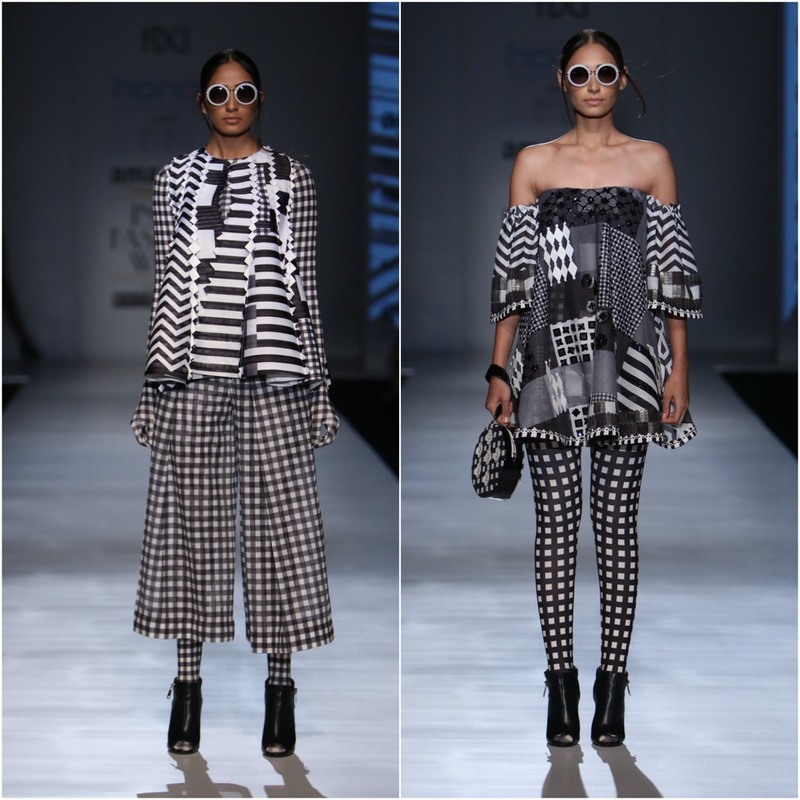 The idea of illusion is played with by combining pattern on pattern and checkered prints in varying scales. We truly admired the unique patterns & designs. Also were stylish capes & jackets all made in fabrics like mesh, waffle and honeycomb jerseys which serve as a canvas to the detailed embroidery. Some of the fabrics are even inspired by television test patterns of yesteryears. Surface texture plays the highlight of the collection where oversized embellishments, leather appliques and fringes come together seamlessly to dramatic effect. All the models were sporting a slick ponytail with a few loose strands. You can’t miss the Yves Klein blue which adds a playfulness & boldness to the collection. Frocks & layering in blue and capes paired with black heels were simply cool & chic. The combo of black & blue worked well (You can never go wrong with this combination). The off-shoulders gave a bolder impression to the collection. Pankaj & Nidhi’s work of imagination & creativity was simply outstanding! It was the true definition of style through their eyes. A nice, different & sophisticated collection! I can definitely say it is a great & successful effort by the duo! LASTINCH- For the curviest curves!